Writing a great resume is a balancing act. You need to outline your portfolio with professional keywords in your field, but also stand out from the pack. In addition, you need to strike a balance between presenting brief career highlights for recruiters who view resumes at a high-level while describing a greater depth of your experience for hiring managers who are taking a deeper dive. Choosing the right format for your resume depends on your industry or profession. Careers like banking, finance, and law are considered traditional, while positions in advertising, fashion, art, and innovative technologies are more creative. Many fields are somewhere in between. As a rule of thumb, standard resume formats are expected in traditional fields. On the other hand, job seekers in creative fields have used innovative new formats including video, websites, social media tools, and even handmade books and artifacts to craft successful resumes. According to a recent CareerBuilder survey, 61 percent of employers prefer a resume that is customized to an open position.2 CareerBuilder also found that 48 percent of employers spend less than two minutes reading a resume. That means you should prepare a separate resume for each job that you apply to, preferably using bullet points and highlighting your most relevant skills and experience. Whatever you do, choose your words carefully so that you are not featuring outdated or irrelevant skills. With these tips and a mention of your higher education, you could achieve your goals and land the job you have been waiting for! Count on a Great Accounting Resume! Your resume has to stand out in a pile of papers. Once it is noticed, it also has to demonstrate you know the accounting industry. An effective resume delivers the information employers need up front and then provides something memorable or different. A professional accounting resume is no different, with your skills presented front and center. Using accounting lingo naturally throughout also shows you’re familiar and comfortable with the everyday language you will need. The basic role of a resume is to demonstrate to an employer that you can handle required tasks using acquired skills supported by proper educational qualifications. What people often forget to do is shape their resume to the job description presented to them. As an accounting job candidate, you should talk about the company in your objective, making it as specific as possible and linking back to your skills. Use short-term goals first, rather than long-term, generic goals. “To be employed at a company I respect at a job I love” doesn’t cut it anymore, if it ever did. Keep this objective short, just one or two sentences. Those who hire for accountancy positions do not want generic resumes that could be sent to any employer out there. Start with that idea as you build your resume. Employers want to know your skills, clear examples of work ethic and effort and, finally, some hint of your personality. A professional resume for an accountant provides this in clear sections with bulleted lists, not a narrative. Your story comes in your cover letter, which should be equally focused without rambling. Then list your applicable degrees, certifications, and other education. People often separate these, into education and skills, but there’s really no need – they all speak directly to your ability to do the job. A master’s degree gets noticed quickly in a professional accountant resume, especially if you’ve been able to complete it in a shorter amount of time than is usual. Being a CPA or noting you’re currently pursuing a CPA or other similar, major qualification is important, too. It shows you know what is expected and that you are developing professionally even while seeking employment. A truly well-crafted resume will cite examples of how a degree or qualification helped solve a real-life problem at work. A familiarity with laws and legalities can be hard to get across on a resume but it’s a skill employers do look for and notice. If you’ve taken special courses or classes in these areas, note them. If you haven’t, look to learn this critical information, as well. Any awards or special distinctions come at the end of the resume. There, those related to accounting come first. Then follow those only with those relevant to the position to which you are applying. Finding out ahead of time the software a company uses is a good step. That way, if you’re familiar with you can put it at the top. If you’re not, you can research it and learn it. Finding out can be as simple as calling up and saying you’re applying for a job and wanted to know the main software the company uses. If you have special skills in software programs used in accounting that go beyond the usual QuickBooks or Microsoft Excel, mention that, too. Many accountancy programs apply to specific industries, such as banking, warehouse management, or healthcare. Broadening your technical expertise to include some of these industry-specific packages is extremely useful. Familiarity with Quickbooks, Sage50, Xero, Turbo Tax, or even something basic such as the Wave Accounting app for small business, goes a long way to increasing your attractiveness to a broad range of employers, as well. Be as detailed as possible by bullet pointing responsibilities and accomplishments achieved in various job positions. When information is specific such as “managed databases for multiple company offices” or “reduced credit repayment to under 90 days for 80% of clients”, it demonstrates the changes you are likely to bring to the new job. The most common way to present this past information is chronological, but it’s not necessary. Add only those positions where you did work relevant to the current position. Write a sentence at the top, telling your prospective employer that you’re doing this, so they don’t have to speculate why they see strange gaps in your employment. This way of presenting your employment history is something different and therefore memorable, without being in any way confusing. In your closing paragraph, explain why this role is important to you and what you do to keep your interest level high and your knowledge growing. Character traits you want to get across are that you’re organized, manage your time well, welcome change, and communicate effectively. Finally, with this great resume in hand, it needs to be seen. The big firms are a great place to start, but don’t forget to post your resume on city or regional job boards. Finance and accounting organizations also post job listings, such as this one at the American Institute of CPAs. They also allow you to build career profiles, asking the questions they know employers want to know. Because accounting recruiters know the jobs and can organize them well, these type of sites are great places to have your resume seen. Interviewing can be an intimidating task. Having a strong resume behind you will not only impress your prospective employer but, will give you confidence throughout your interview. 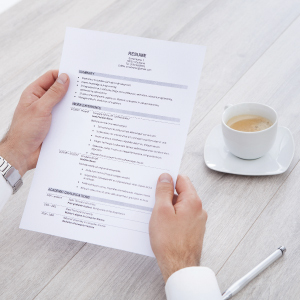 If you have never built a resume before, use the above as an outline or give your existing one a refresh. 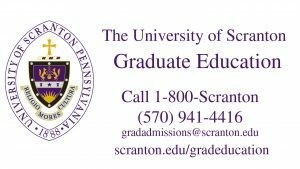 To learn more about the Master of Accountancy program at The University of Scranton, click here.